The sun grazed my shoulder, bared by a halter top as blue as the Pacific Ocean swelling but a hundred yards away, so I stepped beneath a peaked tent to rest in the shade and found myself in the midst of a farmer's market as wild and diverse as the bazaar in Joyce's "Araby." Dark pink slabs of ahi rested in rows on my right while magenta orchids tangled in buckets on my left. I wound through tufts of pineapples, mountains of mangoes, curtains of Hawaiian shirts, strands of pearls, and pods of bronzed dolphins. As I rounded the final bend, I came across a sight rarely seen even at a carnival like this one. Resting on three card tables were a dozen boxes of old magazine advertisements and articles backed with card stock and covered in cellophane. Being interested in American popular culture as I am, I started flipping through the collectibles. Judy Garland sold Max Factor Pan-Cake Make-up, Jane Russell posed pin-up style on the back of Yank magazine, but there, behind the movie poster for Mutiny on the Bounty, I saw it. No, not the Chesterfield commercial featuring Rosie the Riveter, not the November 1st, 1968, cover of Life snapping Jackie and Onassis mere moments after they took their vows, here at the farmer's market in Hilo, Hawaii, I found a 1939 Life article announcing, "Television: It makes its commercial debut this spring with World's Fair." 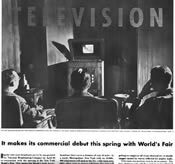 The article opens: "Regular television broadcasts are to be inaugurated by National Broadcasting Company on April 30 in conjunction with the opening of the New York World's Fair. This means the decade's most revolutionary invention is at last ready to emerge from the laboratory and make its commercial debut in America." But the writer seems uncertain of the invention's success, "If the television consumer market were large enough, such expenditures [tens of millions by promoters and $250,000 for transmitting equipment for each television station] might warrant the expectation of sizable profits. Unfortunately, however, television is, so far, doomed to small areas and hence small markets, because at present, transmitters can broadcast their waves a distance of only 50 miles. As a result, Metropolitan New York with its 10,000,000 inhabitants will rank as the No. 1 television area. Only other cities to receive television this year will be Philadelphia, Los Angeles, and Schenectady. Ultimately all centers of over 100,000 inhabitants may be covered. But at best television in its present state will reach only 6% of the land area of the U.S., in which live 50% of the population." The skepticism continues, "Whether television consumers will be satisfied with programs consisting mainly of newsreels, one-act plays, fashion shows and interviews is a question no one can answer." To think, the glowing box that daily holds the majority of Americans hypnotized has only been a part of our culture for seventy-two years. Decade's most revolutionary invention? Try century's. In terms of impact on popular culture, no other invention has so dominated, influenced, and changed the American lifestyle as the newfangled contraption first displayed at the 1939-40 World's Fair in Flushing Meadows, Queens. And how fascinating to feel the writer's skepticism. In the ensuing decades, television would reach far more than 50% of the population, profits would far exceed investments, and consumers would be enthralled. As I wandered away from that stand with my freshly purchased Life magazine article tucked neatly under my arm, I was astounded once again by the technological progress of the twentieth century. In the days and nights of 1938, Americans read or played bridge or listened to the radio or went to the movies, but they did not gather in front of the television set to ogle at the latest episode of Survivor or laugh along with Seinfeld, a ritual we consider commonplace and take for granted today. Television not only "made it" after its debut at the World's Fair it has become an entrenched part of our culture; indeed, it only continues to grow and improve with, for example, the current release of high definition and the post-1980 explosion in cable channels. Thus in the end, I must say, the double entente buried in the subtitle, "Its range is short, its road narrow," could not have been further from the truth. Regardless of the wisdom and foresight of the writer (or the lack thereof), I still could not believe my luck in finding this buried treasure, more precious to me than the roaring falls, the soughing palm trees, the sweeping rainbows of my beloved Hawaii--the original Life magazine article announcing the debut of that funny new invention called television.